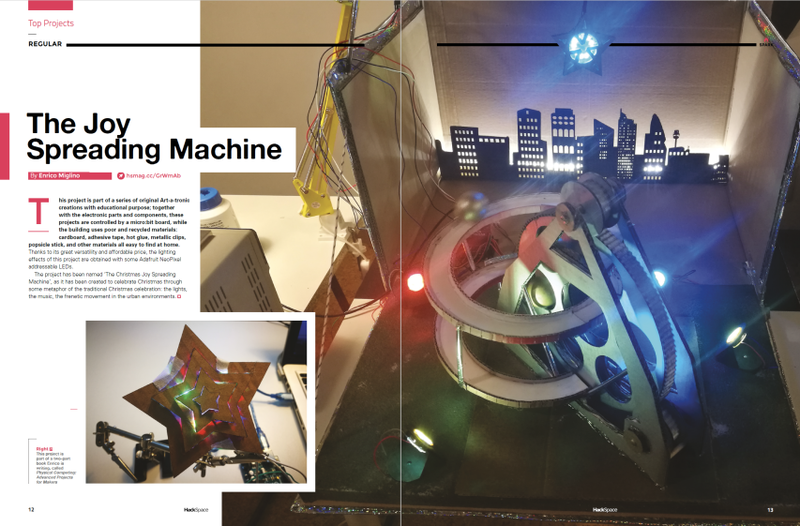 Issue 17 – HackSpace magazine “The Joy Spreading Machine” #NeoPixels #Microbit @HackSpaceMag @HacksterIO « Adafruit Industries – Makers, hackers, artists, designers and engineers! Issue 17 — HackSpace magazine has a great article on Enrico Miglino’s Joy Spreading Machine. This project is part of a series of original Art-a-tronic creations with educational purpose; together with the electronic parts and components, these projects are controlled by a micro:bit board, while the building uses poor and recycled materials: cardboard, adhesive tape, hot glue, metallic clips, popsicle stick, and other materials all easy to find at home. Thanks to its great versatility and affordable price, the lighting effects of this project are obtained with some Adafruit NeoPixel addressable LEDs. The project has been named ‘The Christmas Joy Spreading Machine’, as it has been created to celebrate Christmas through some metaphor of the traditional Christmas celebration: the lights, the music, the frenetic movement in the urban environments. Read more & PDF (pages 12 & 13). See the full project tutorial on Hackster.io here and the code on GitHub.